n the second half of this year, Zongshen released an important retro model, the RE3 (ZS400). It is the latest model developed based on Zongshen’s new twin powerplant TC380, which was firstlyequipped on RX3S. 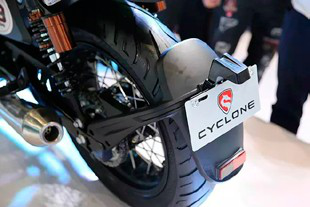 Prior to the RE3, Cyclone family does not have a retro model, and Zongshen only has the WEEK 8 - the entry-level retro bike that was well sold home and abroad. RE3 looks a bit like WEEK 8, with a silver-gray body, a long stainless steel exhaust, and a striated tank, but it is definitely a super elegant retro bike. RE3’s headlight has five built-in symmetrical lens LED bulbs, which is the same to that of RZ3S. The light yellow windshield above the headlight makes a good decoration. 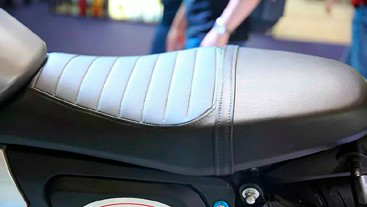 The screws holding the windshield are fitted with rubber pads to reduce vibration and noisewhen the riders drive at a high speed.The 17.5L fuel tank is large enough for daily riding purposes. The sil- ver-gray finishing coat looks quality. The wide and thick one-piece vintage style saddle is made of leather, with exquisite workmanship. The tail design is simple, with a small mudguard, round LED taillights, and two LED turn light bars. The design of a rear mudguard improves the practicability of the RE3. RE3 has an inverted shock absorber at the front and a double spring shock with air bag at the back. The brake system is also commendable, with front double piston floating caliper. ABS will be available later. The front wheel with steel wire looks complicated yet powerful. Steel wires do not penetrate through the rim of the vacuum tire. This type of tire is not commonly used on a domestic bike, but on high-end import- ed models. The aluminum wheel rim is exquisitely manufactured with good quality material, which improves the quality of the entire bike. It represents the aesthetic design of a retro bike, and in the meantime reduces the trouble of tire repair. The tires are supplied by TIMSUN, and the patterns tend to be suitable for paved road. 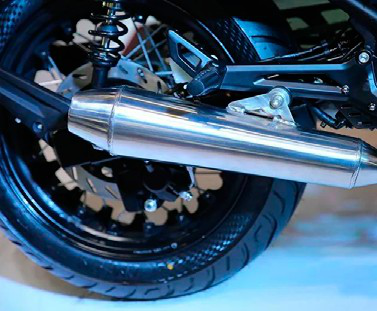 The exhaust pipe is made of stainless steel, and is designed at both the left and right sides. tective cover under the tank, stands a bottle that holds antifreeze liquid. RE3 is also designed with a flameout device that shuts off the engine when the side stand is put down. The bike uses 520 oil seal chain. 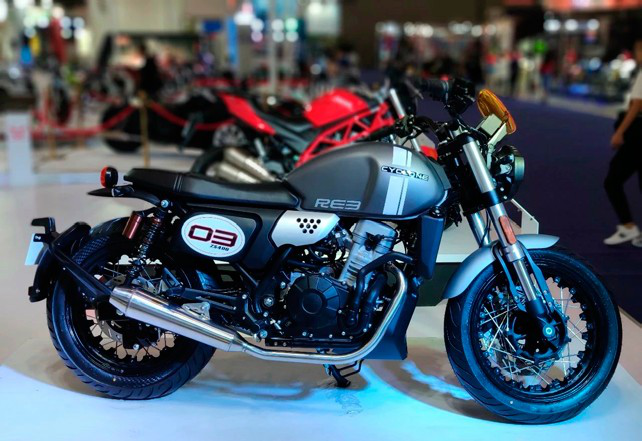 RE3 carries a Zongshen’s TC380 water-cooled eight-valve DOHC two-cylinder engine, with an actual displacement of 378.8ml. The maximum power is 27kw/9000rpm, and the maximum torque is 35N•m/6500rpm. 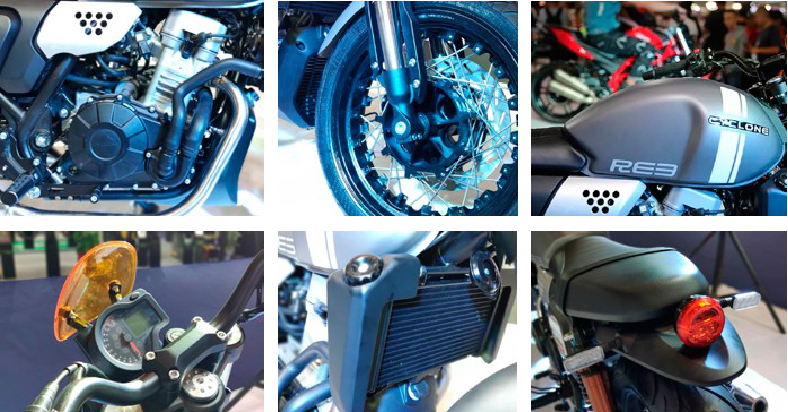 Since it adopts the same powerplant as RX3S, the bike should be using a Delphi EFI system. The engine adopts a 180-de- gree crankshaft design, which can offset the forces during running. In addition, the built-in balance shaft further reduces engine’s vibration. RE3 uses a camshaft rocker arm with roller bearing in the air distribution system, which reduces the power loss by reducing friction resistance, improving the service life of the engine. The six-speed transmission, adopting a larger diameter shift drum and the “biax shifting fork” technology, brings easier and smoother gear shift- ing. The Chinese market is now lacking in large displacement two-cylinder retro bikes, and this type of bike becomes popular among riders. Al- though other manufacturers have planned to launch similar products, Cy- clone moves faster. With the existing mature powerplant and Zongshen’s development strength, RE3 will be available in the market very soon. Previous：Take a look at this RX3 designed especially for the Vietnam fire department! What do you think? Next：On October 31 the RX3S and RX4 started their trial route! We are getting ready for its launch!